In a successful season in which the Redblacks reached the 106th Grey Cup, four Ottawa players were recognized as the best at their positions in the CFL. Brad Sinopoli, Lewis Ward, Diontae Spencer and SirVincent Rogers were all selected to the 2018 CFL All-Star team. This is the first CFL All-Star selection for Sinopoli (receiver), Ward (kicker) and Spencer (special teamer). It is the second selection for Rogers, who received his other all-star nod following the 2015 season with Ottawa. Sinopoli and Ward were part of a group of just eight Canadians who were selected to the team. 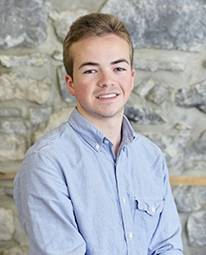 The former University of Ottawa standouts continue to receive recognition for what was a banner 2018 season for both. They each set their own CFL records and combined to take home three CFL award honours at the Shaw CFL Awards show a few weeks ago. Last season, receiver Greg Ellingson was the lone Redblack to be selected to the league all-star team. It was the other member of “The Buds” receiving duo who was selected this time around. 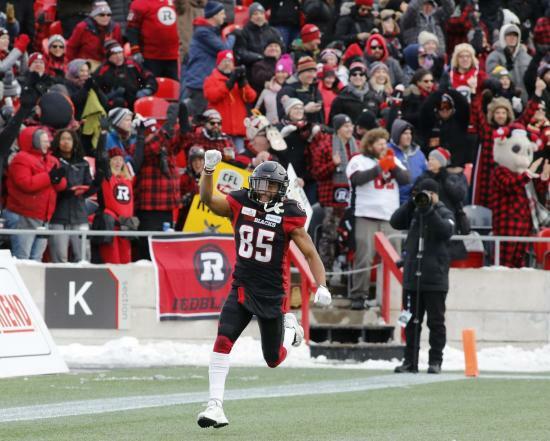 2018 marked the fourth straight 1000-yard receiving season for Sinopoli, who has reached the mark in each of his four years with the Redblacks. He also set a CFL record for receptions in a season (116) by a Canadian receiver. His performance helped him take home the Most Outstanding Canadian award. In his rookie season, Ward distinguished himself as the most consistent kicker in the CFL. He converted the second most successful field goal kicks in the league and set a pro football record with 48 straight attempts without a miss. He won the CFL’s Most Outstanding Rookie and Most Outstanding Special Teams Player awards. While the Ottawa offensive line went through some turmoil and change through the season, SirVincent Rogers was a constant and reliable force at the point of attack for the Redblacks. He started 17 of the 18 regular season games, missing the regular season-finale only due to the fact that the East’s top seed had already been clinched and Ottawa was resting their stars for the playoffs. He protected the blindside for quarterback Trevor Harris as the East Division champions’ left tackle. Spencer was a threat in two phases of the game for the Redblacks. He finished top 10 in all three major receiving categories (receptions, receiving yards and receiving touchdowns), but was selected to the all-star team for his ability to impact the game on special teams. He finished with the most punt return yards (849) and third most kick return yards (815) in the league. According the list of potential free agents released by the CFL, both Rogers and Spencer were in the last year of their respective contracts and could reach the open market when free agency begins in February. 11 Redblacks were selected to the East Division All-Star team at the beginning of November. Those who were selected to the division but not league all-star team include William Powell, Greg Ellingson, Alex Mateas, A.C. Leonard, Jonathan Rose, Rico Murray and punter Richie Leone. The CFL All-Star team is voted on by the Football Reporters of Canada and the CFL’s head coaches. Of the 27 players selected, only nine came from the East Division. Those nine were all from the East’s two playoff teams: four from the Redblacks and five from the Hamilton Tiger-Cats. Two years ago, the Calgary Stampeders were forced to watch the confetti fall on the heads of the Ottawa Redblacks, Grey Cup in hand. In Edmonton Sunday night, the roles were reversed and revenge tasted sweet for the Stamps. 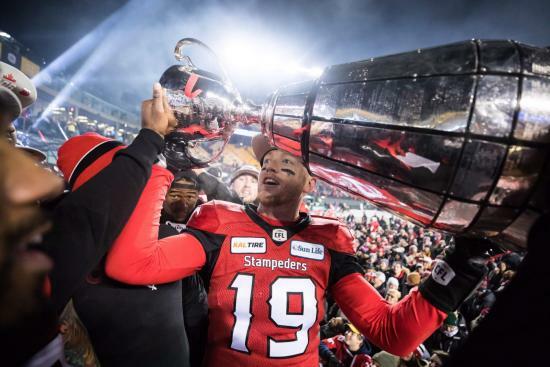 The suffocating Stampeders defense stands in the way of Harris and Grey Cup glory. Harris says he is prepared for the circus that is Grey Cup week. Sunday’s Eastern Final at TD Place was hardly a contest. 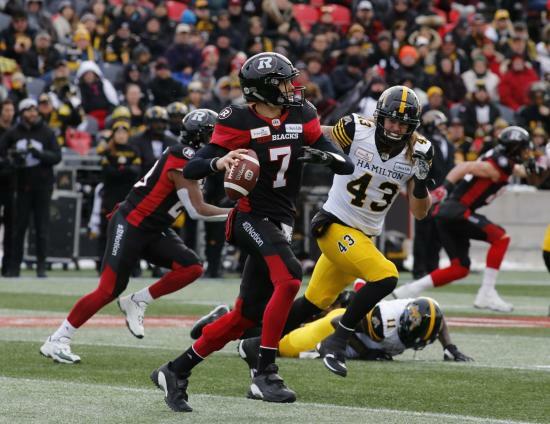 The Ottawa Redblacks blew out the Hamilton Tiger-Cats 46-27.